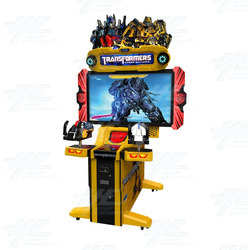 TRANSFORMERS: Human Alliance is an upright deluxe arcade machine that partners players with one of three of the movie's stars, Optimus Prime, Bumblebee or Sideswipe. Players must battle their way across America, Africa and Europe destroying the Decepticons before they find the All Spark, a material capable of bringing any mechanical or electronic object to life. The two player cabinet features a Bumblebee themed cabinet art with a Bumblebee marquee, a 55" LCD monitor with HD graphics, LED lights and fun mission based game play. Defend five different cities from Decepticons with your favourite Autobot at your side! To date, the three TRANSFORMERS movies have taken in over $2.6 billion! TRANSFORMERS is a brand that's universally recognised for delivering high quality, high-energy entertainment, and Sega are proud to be bringing it to amusement arcades! The two player cabinet features a Bumblebee themed cabinet art with a Bumblebee marquee, a 55" LCD monitor with HD graphics, LED lights and fun mission based game play. Defend five different cities from Decepticons with your favourite Autobot at your side! To date, the three TRANSFORMERS movies have taken in over $2.6 billion! TRANSFORMERS is a brand that's universally recognised for delivering high quality, high-energy entertainment, and Sega are proud to be bringing it to amusement arcades! Features two, cabinet mounted shooters - two player cabinet! Bumblebee themed, Upright Deluxe cabinet! 55" LCD monitor with HD graphics! please note. dimensions and weights are based on the 42 inch model and are subject to change when more information becomes available.